(Nanowerk News) 3D printing, or additive manufacturing, is the process of turning a 2D digital image into a 3D object through printing successive layers of materials until an entire item is created. Initial images are created in design software programmes before being realised through 3D printing. The advent of consumer 3D printing has the potential to revolutionise its use as a technology, but also opens up a whole host of intellectual property (IP) debates. The IP laws in the UK were created long before 3D printing, or any of its associated technologies came about, which means that legislation often lags behind the issues being faced by UK consumers and businesses. 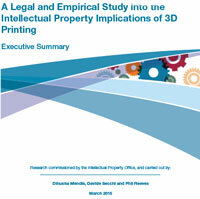 It leads to a number of grey areas, many of which Dr Mendis has tackled in her recent research for the UK Intellectual Property Office ("A legal and empirical study into the intellectual property implications of 3D printing"), in collaboration with Econolyst, the leading 3D printing and additive manufacturing company in the UK. As a technology, 3D printing has the potential to impact on a vast number of markets, ranging from toys and games for consumers, to personalised health equipment such as hearing aids, through to highly specialised parts to be used in aircraft. Its variety of uses also means that the potential impact on existing intellectual property laws is difficult to predict. For example, what would be the copyright implications be if an individual modified an existing design file or scanned an existing object to create a new design file? Can computer-aided design (CAD) files be protected under copyright law? What are the implications of modifying someone else’s CAD file? For businesses, copyright issues could arise when replacement parts are produced, perhaps through a thirdparty supplier. As 3D printing becomes more popular and more accessible to the average consumer, the key issue for businesses will be ensuring that their products are readily available through legal channels. While it will be some time before 3D printing becomes as widely available, precedents from music and film sharing platforms suggest that the more accessible content is made for consumers, the less likely they are to resort to illegal downloads. By being conscious of these trends and building business models which take into account past precedents, the development of 3D printing as a consumer technology could avoid potential difficulties in the area of intellectual property rights law.